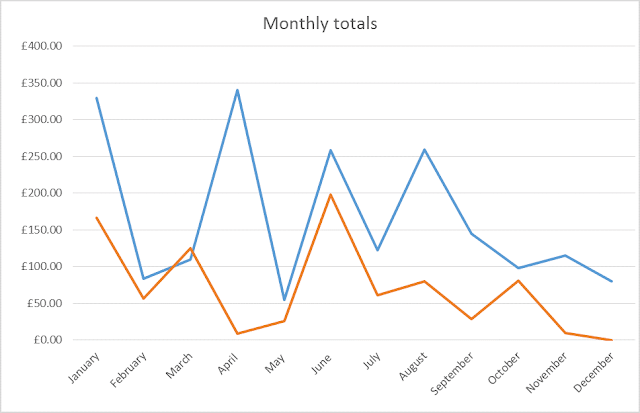 At the beginning of last year, I decided that I would start taking note of what I was spending on my wargaming each month. This was partly inspired by the Frugal Gaming series from Warhammer 39,999 and partly because I was curious as to what I was actually spending. 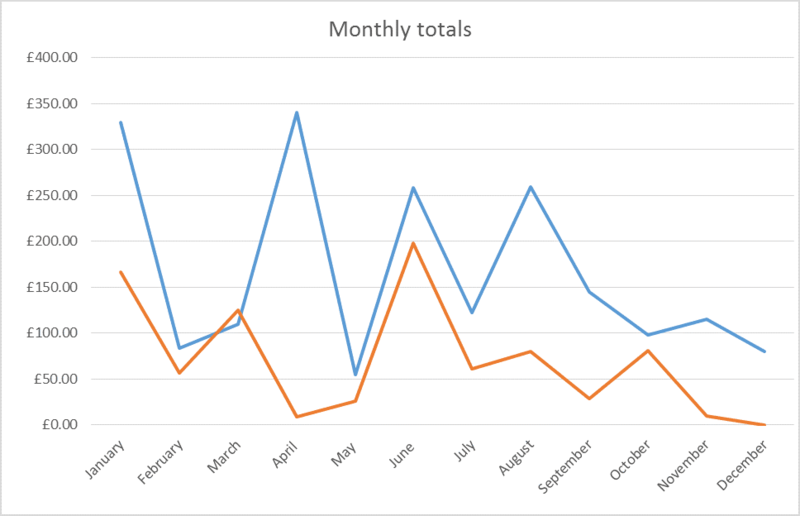 With 2015 having come to a close, I thought that I would review my spending in the last year, looking at what I got for each army and other hobbying aspects. Perhaps unsurprisingly, months were I sold a lot on ebay resulted in bigger spendings on new stuff (I had all that paypal money burning a hole in my pocket!). Only in March did I sell more than I bought. The biggest expenditures were in January and March. These both contributed towards my White Scars army, as well as purchasing two new board games (that I am still yet to play!). As 2015 draws to a close, I thought I would take the opportunity to look at what has happened in the past year with respect to my hobbying. So put your feet up, grab the leftover turkey and join me in reminiscing over the past 12 months. Have a random picture that in no way represent this post. 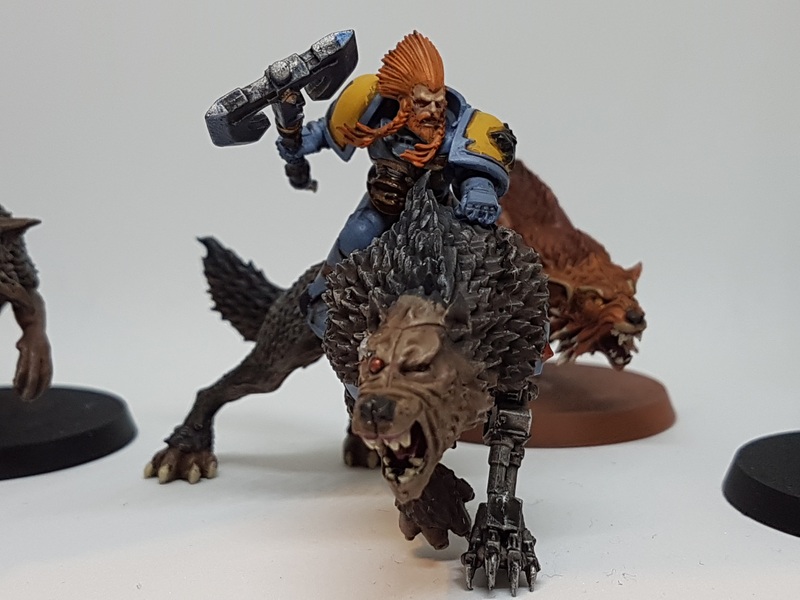 By far the biggest change in my hobbying for this year was starting this very blog you are reading right now (or at least, quickly skimming through until you find something of interest). 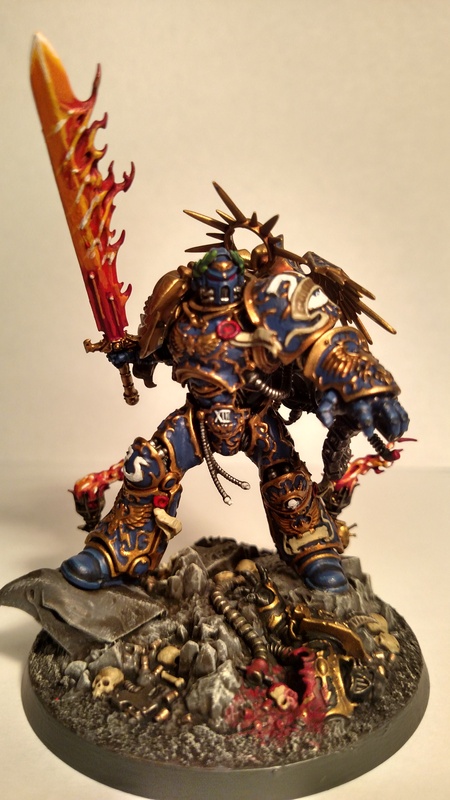 Despite playing 40k for over 10 years now, I have only become a recent active member on the online community. It is only in the past 18 or so months that I have become a more active member of 40k online. I used to read the occasional blog or rumour site online to keep up to date with what was happening, but never dreamed of commenting on any posts or articles, never mind starting my own blog. That all changed when I became more active in the St Andrews University gaming club. I became the wargames rep for a year and starting running a campaign and organising apocalypse games within the club. As part of the campaign, I started sending out weekly updates to the group with battle reports of my games that week. 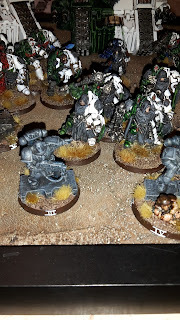 I started wanting to share my opinions on gaming with others, to highlight some of the terrain projects that I had been working on and to comment on some of the changes to 40k that were happening. This all came to a head when I signed up to attend Blog Wars 9. Since I would be attending Blog Wars, I decided that I wanted to have my own blog. It was something I had been thinking about for a while and finally took the plunge in April. Fortunately, I had the club's upcoming apocalypse game as a nice starting point for the blog, allowing me to showcase a huge battle in my first few posts. 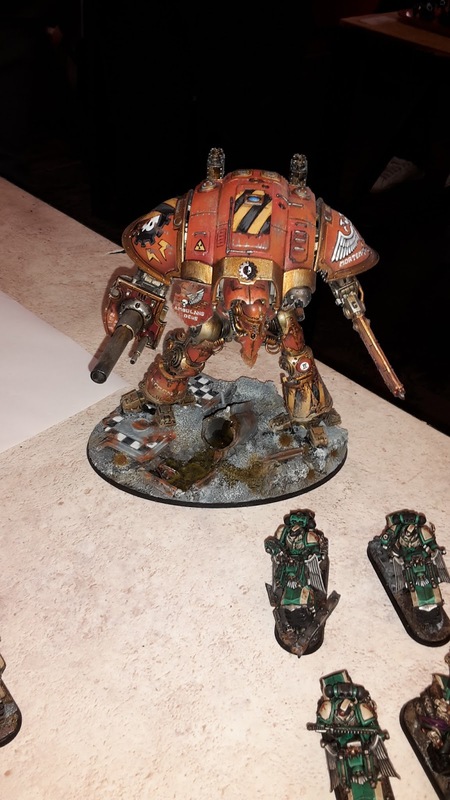 I want to give a big shout out to Dave (Confessions of a 40k addict) and Alex (From the Fang) for their advice on starting the blog and for the continued inspiration that their blogs provide. It's highly unlikely you are not aware of their blogs, but if you are not, check them out. I have found that having the blog has been a huge boost to my own hobby progress. Wanting to share my progress on projects and games has led me to spend a lot more time on 40k than I have been previously; playing on a regular basis, actually getting stuff painted in a timely fashion, attending tournaments for the first time in over a decade, reading and commenting on many of the fantastic blogs I follow. 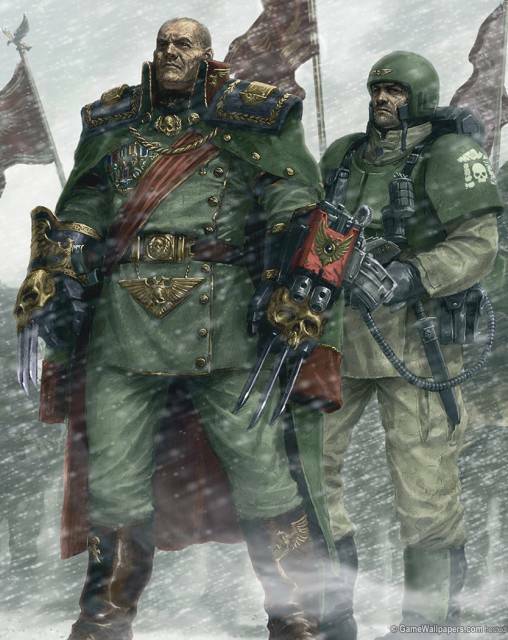 Having the blog has given me a lot of excitement towards 40k at the moment, and I hope it continues into the future. 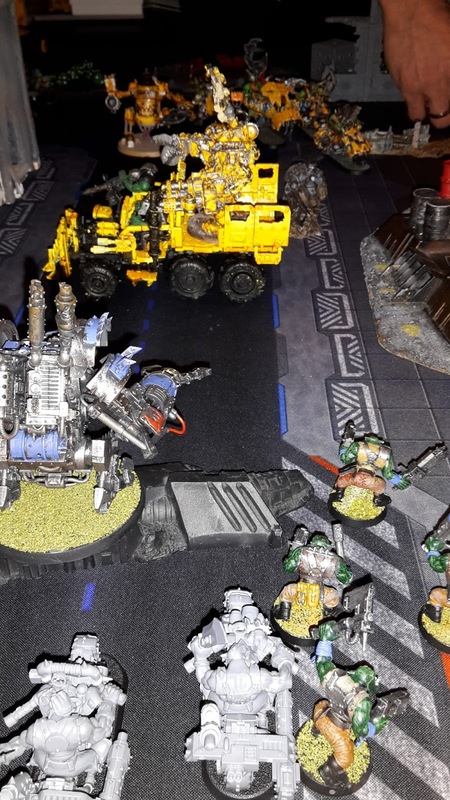 This week's battle report features my Ork army taking on Adam's Grey Knights. 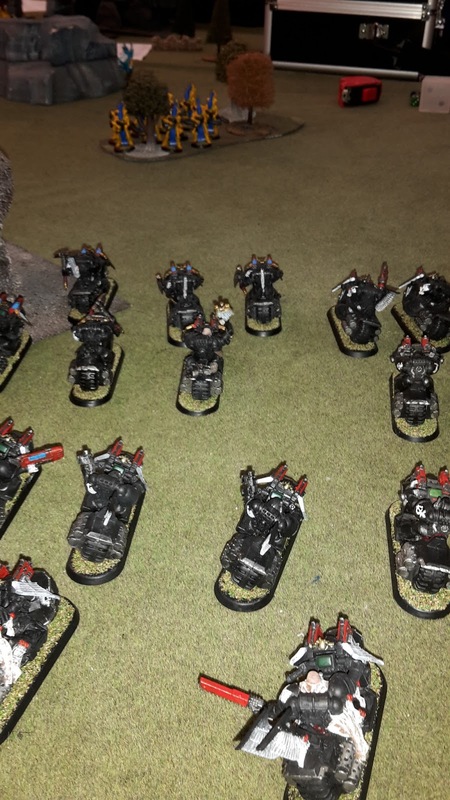 Adam was wanting to take on my Orks, so I thought they would saddle up once again to take on the Emperor's finest. I started with a Warboss and Big Mek. The Warboss is a hard hitter, able to plough through marines. 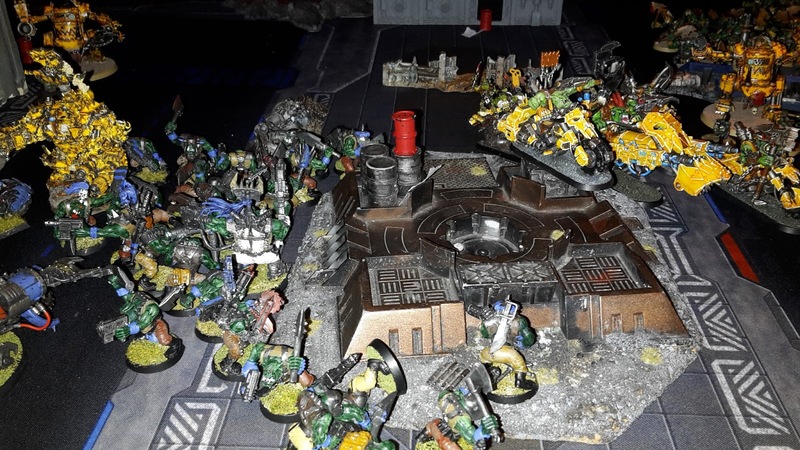 The Big Mek took a Kustom Force Field to help protect the boyz from the Grey Knight's firepower. I then took three big mobs of boyz, enough to weather the firepower of the opposing army and still pack a punch in combat. The Lootas were there to provide some serious firepower to the army. They can put out an incredible number of high strength shots when they eventually hit. I took a unit of trukk boyz and a unit of Meganobz in a trukk to give my army some mobility and some hard-hitting power. 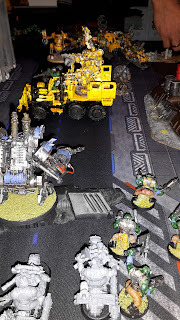 The Meganobz were taken to provide a very tough unit for Adam's army, I was impressed with how tough Seb's Meganobz proved to be in a previous battle report, needing power claws to come close to denting them. Finally, I finished the list with a Dakkajet. Apart from being an amazing model, this flyer can put out a lot of highly accurate firepower (at least for Orks). My warlord trait was Might is Right, giving the Warboss +1S. Not too useful with a Power Claw armed Warboss. 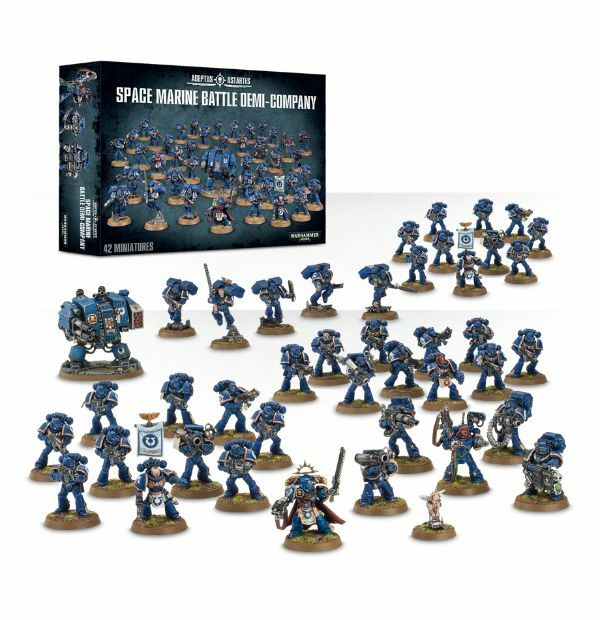 £79.90 (WS) Space Marine army bundle. As you can see, not a lot this month. My only purchase was a bulk army deal that I found on ebay. This contained a wide variety of units, including tactical marines, devastators, assault marines, terminators, grey knights, a terminator librarian, rhinos, razorback and a drop pod. 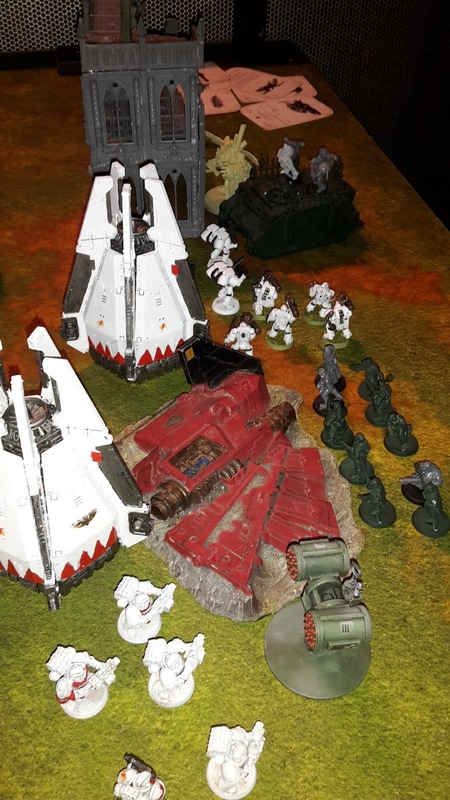 My plan is to keep some of the transports for my White Scars to use in some of the new formations. The rest I plan to re-sell on ebay in the new year, hopefully equalling or beating the price that I bought them for. 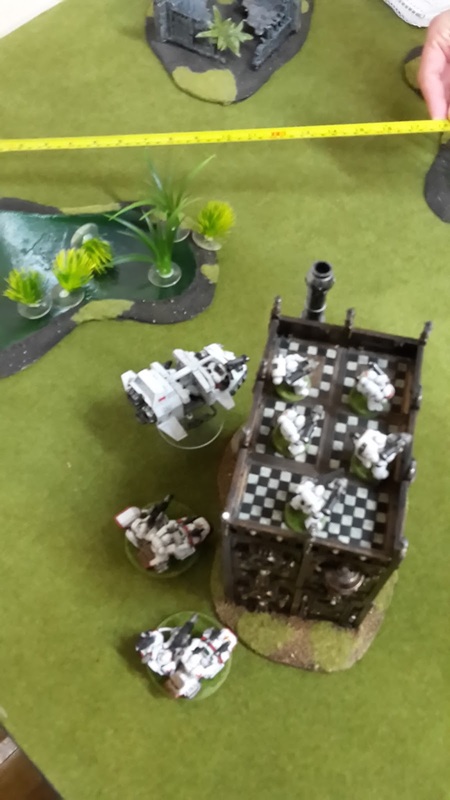 This week's battle report sees my White Scars take on Iain's Chaos Space Marines. Iain is a recent addition to the Medusa IV map campaign that I am running and we finally got a chance to play one another (we have had games scheduled in the past that were cancelled last minute due to illness or weather). 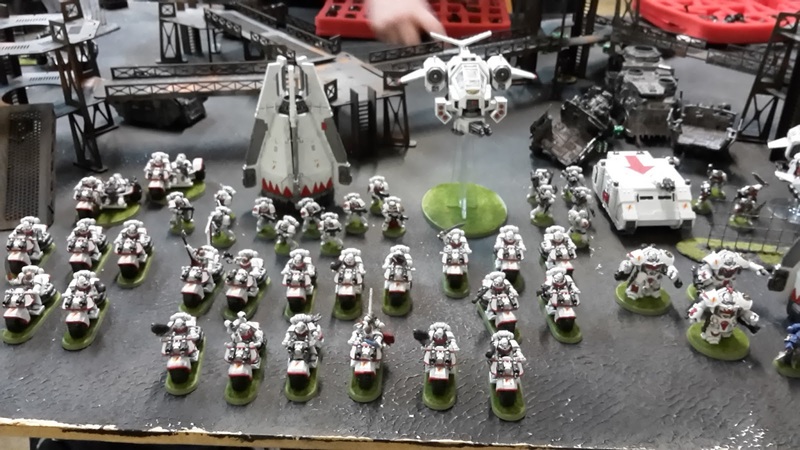 I have been playing the same kind of army with my White Scars for a while now, practising for tournaments and refining my standard list. I decided for this game to try something new, to take units that I wouldn't normally play and to mix things up a little. Formations seem to have become an integral part of army building in 40k these days. 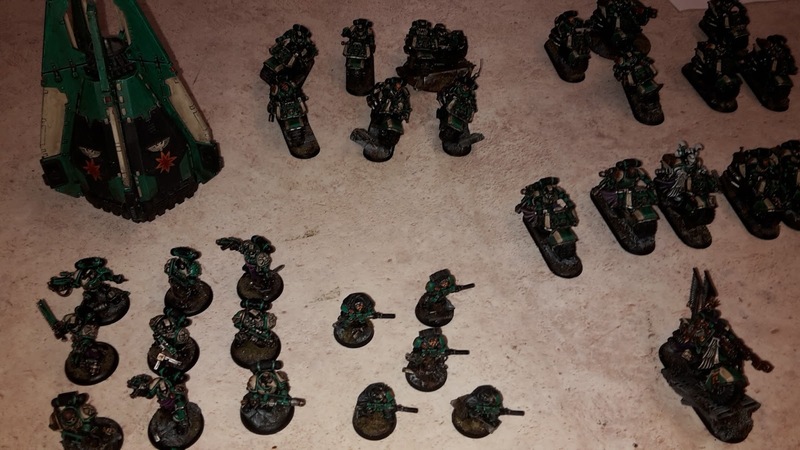 Whether that is a good or bad thing is for each individual to decide, today I thought I would take you through my thoughts on formations and how I feel they influence the vast universe of warhammer 40,000 these days. Right off the bat, it is only fair to let you know dear reader, that I rarely use formations in 40k. This is not due to some particular stance on the use of formations, I just like the Combined Arms Detachment (CAD) and find it the easiest way to make up an army and what I have been used to for many years. The second issue is that even with my vast collection of models for some armies, I sometimes still struggle to have the basic requirements for many of the formations that I can field, so am limited in this respect too. The one exception to this is the Ravenwing Strike Force from the 7th edition Dark Angels codex. 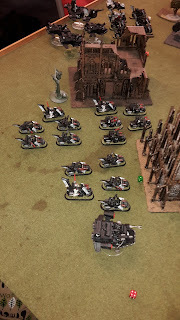 Being a big fan of Ravenwing (and bike) armies, I have utilised this formation a lot in recent months, even taking an all Ravenwing army to the recent Blog Wars X tournament using the formation and having a measure of success with it in my games. So this is where these opinions and impressions come from, a player who generally doesn't use formations, but has some experience both playing with them and against them in a competitive and casual environment. Also, a note of nomenclature. I tend to use Formations and Detachments interchangeably when talking about them. I know that there are differences between the two, but to me, the comments on one could be equally applied to the other. You could argue that one of the earliest instances of the use of formations in 40k was the introduction of the Force Organisation Chart in 3rd edition 40k (I certainly would argue this, and since this is my article, I can do what I want!). Hasn't changed much at all. Prior to 3rd edition, armies were constructed using the percentage system. Your army would be composed of units/models based on the percentage of the points used, for example; 25% or more core units, up to 25% characters, etc. 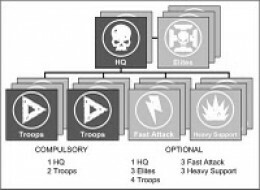 When 40k was re-launched with 3rd edition in 1998, a new mechanic for army building was introduced- the Force Organisation Chart (now known as the Combined Arms Detachment). For the first time, units in an army were separated into 5 different types; HQ, Elites, Troops, Fast Attack and Heavy Support. Players constructed armies by selecting units from "slots" in the force organisation chart and calculating their points cost for the unit until the agreed upon points limit was reached. The only compulsory choices in your army were one HQ and two troops slots. This limit still applies today in the CAD. The idea was to allow players to build themed forces, more representative of typical armies your fraction would be likely to field. Your army would consist of an HQ unit to lead the army and two units of core troops to provide the backbone of the army. Additional troops units could be used to bolster your force and more powerful units could be taken from the other slots, though in lesser numbers to represent their more limited availability. The biggest expense this month was the trip down to Stockport for blog wars X. 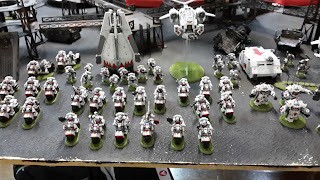 While I was there, I also treated myself to a box of Scout Bikers to use with the new White Scars formations I recently reviewed. For this reason, I also picked up some more bikers and landspeeders from ebay. I only sold one item this month. Someone on twitter was looking for spare leaves from the citadel wood kit. I had a couple of sets lying around and got rid of them. Only one month left in the year to tally up. In the new year, I will be doing a review of my hobby costs for 2015, looking at what I spent and where it went. With the campaign having drawn to a close for the holiday period, I was having a think about how to improve it for the New Year. Inspired by the Cityfight and Planetstrike expansions of old, I decided to make up some Campaign Stratagems for the players to purchase with the resource points they earn throughout the campaign. Campaign Stratagems are some special rules that can be purchased with resource points (RP) for your games. Each Stratagem will cost 30 RP. You may only purchase one stratagem per battle phase (so two in a campaign turn) and must inform your opponent of which stratagem you are using before either army is deployed. The Stratagem must be purchased at the start of one of the Battle Phases, but can be used during any one battle during the campaign turn. Only one Stratagem may be used (per side) in each battle fought. You have obtained camouflage to hide a small portion of your army from the enemy firepower. Select one unit/model in your army (that is not a Superheavy vehicle or monstrous creature). In the first turn, that unit has the Shrouded special rule until they move or fire a weapon. Once they have done this, they lose the Shrouded special rule, but gain the Stealth special rule for turn one. An elite unit has circumvented the enemy patrols to launch an ambush on the enemy lines. Select one unit/model in your army (that is not a Superheavy vehicle or monstrous creature). That unit must be held in reserve and gains the Outflank rule. 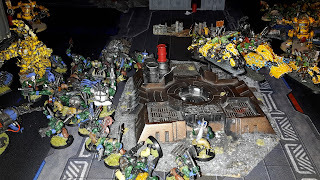 This week's battle report features a civil war between Ork Clans- My Deathskulls army takes on Sebastian's Bad Moon Orks in a straight up brawl for supremacy. 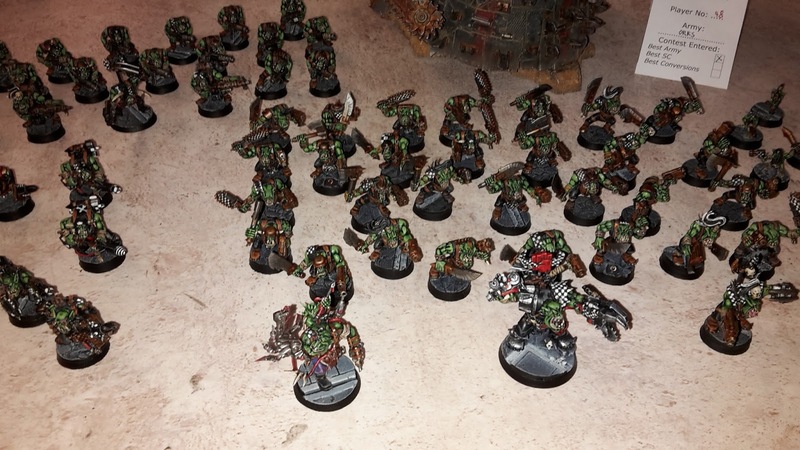 My army is always led by a Warboss. 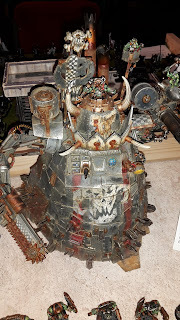 He is the toughest in the mob and allows me to Waaagh if I want to. I took him with a power claw and some armour for protection. I also supported him with a Painboy. I thought he would be more useful than a Big Mek with Kustom force field, as I would get the Feel no Pain bonus in combat too. The Ork horde continued their advance south through the forest. While they were having much fun smashing through the trees, they came upon a Tau outpost that promised even more fun for the Boyz. 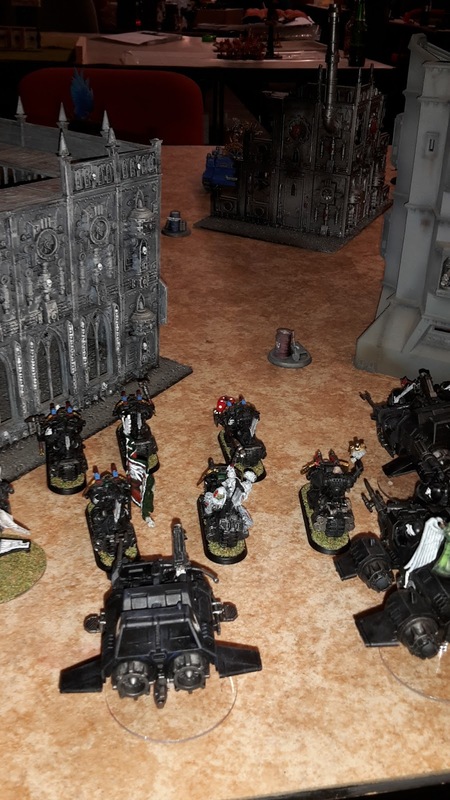 As they were getting ready to attack, they were joined by some Chaos Space Marine allies, newly arrived to the area. The Warboss decided to be magnanimous (not that he knew what the word meant) and let the Chaos Boyz join the attack (after all, once the Tau were out of the way, they could always scrap with the Chaos followers). Damn you GW! 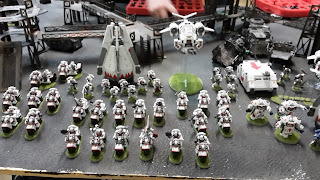 I was doing so well this month until I read the new rules for the White Scars in the War zone Damocles: Kauyon expansion and picked up the book and the White Scars datacards to go with them. Really looking forward to trying out the new formations and Relics when it arrives. I also managed to find a cheap large carry case on ebay for transporting my Ravenwing in one case. This week's battle report comes from a practice game that I had the night before Blog Wars X. 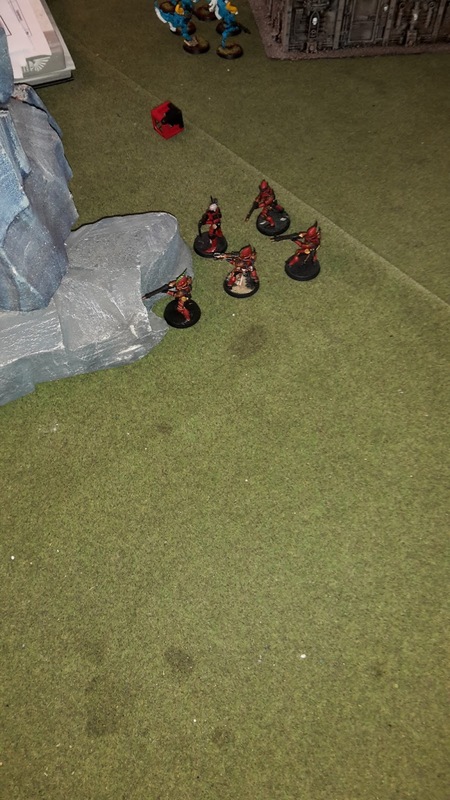 When I arrived in Stockport on Friday night, I had a game against Pete's Eldar army in preparation for the tournament the next day. As a note, due to the comp rules of the tournament, a 2+ re-rollable save (cover or invulnerable) became a 2+/4+ save. This reduced the effectiveness of the Darkshroud by a marginal amount. My Warlord trait was set with Sammael, giving me +3" to charge and turboboost moves. Pete's force was Wraith-heavy and was going to be tricky to deal with. Putting the D-Scythe Wraithguard in the Wave Serpents was problematic, as he could jump out and most likely eliminate any unit he wanted with their flamers. The Wraithknight would prove problematic too, as my Ravenwing army lacked the grav heavy set-up of my White Scars, but hopefully the massed plasma could deal with it. Pete's warlord trait gave him -1 to my Reserve rolls and his Spiritseer got Cleansing Flame, Hammerhand and Banishment. 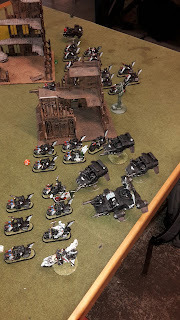 We decided to play the kill points mission, as I thought this would be the toughest challenge for my Ravenwing against Pete and wanted to test them. Once I have completed a tournament, I like to take a look over my list and battle reports to see how the army performed; what units met expectations and which units didn't really do much in the game. With my battle reports from Blog Wars X now finished, it is time to review my list and see how it performed. First off, my results at Blog Wars X were way better than I was expecting. I didn't think I had taken that tough of a list to the tournament and was really surprised with how well some of my games went. I don't know if this was due to some great dice rolling from me and some poor rolls for my opponents, but I don't think I faced any weak armies over my three games (in fact, Matt's army was specifically designed to counter lists like mine). With that said, let's take a look at my units and see how they performed. The Ravenwing Chapter Master was a compulsory choice for my army (in that I wanted to take the Ravenwing Strike Force and needed a special character), but I probably would have taken him anyway. Sammael was my Warlord in all three of my tournament games (as well as the practice games), mostly due to the fact that he is a tough character (T5, 4+ invulnerable and Eternal Warrior) and for his guaranteed warlord trait (+3" to charge moves). His warlord trait is very handy, allowing me to risk long range charges with a greater chance of success. His plasma cannon can be pretty powerful, but it does come with risks. In game 1, he almost killed himself firing it during the game, taking two wounds when it overheated. In fact, a lot of the time, I never got to fire the Plasma cannon as I was too busy Jinking with his unit. In combat, Sammael was quite successful too. He did fight in a couple of challenges, but these were against low level sergeant models. 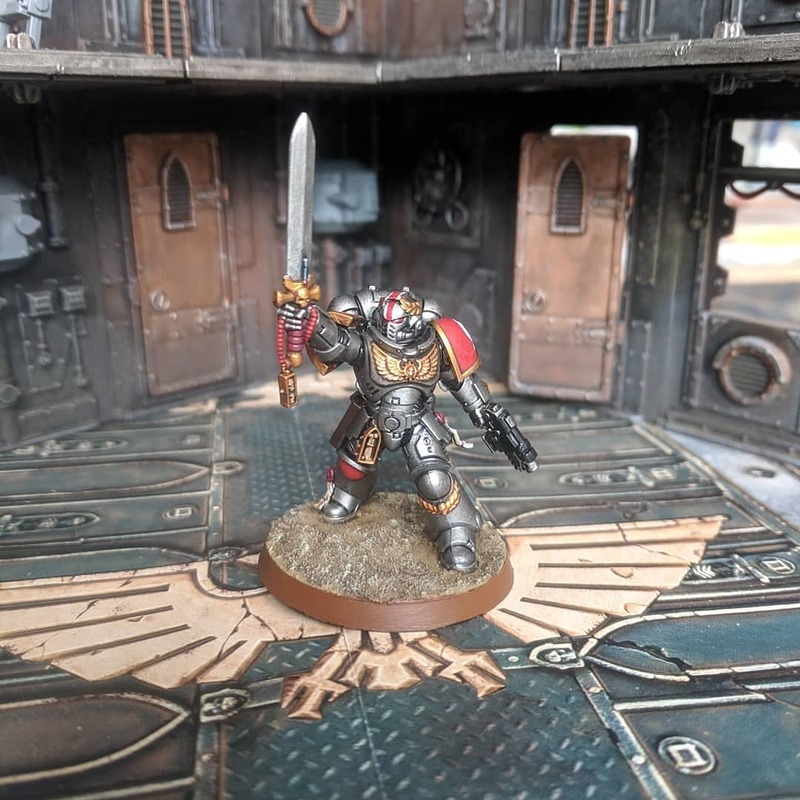 In game 1, he slaughtered a power fist wielding sergeant to help save his squad from harm and took out several of the enemy Command Squad too. 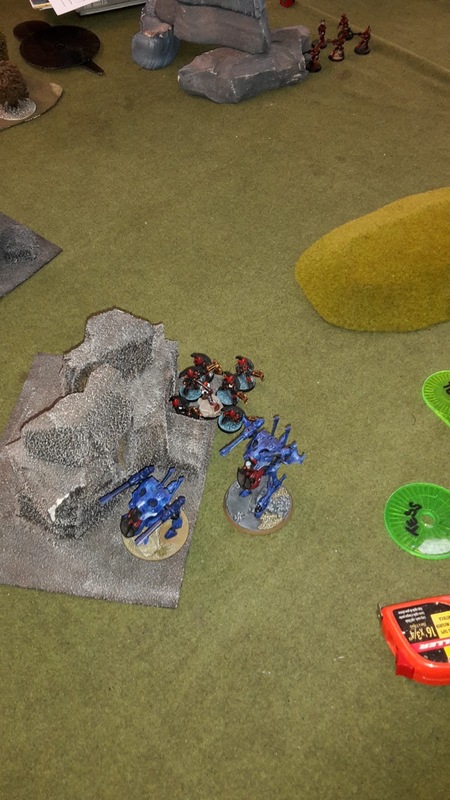 In game 2, he wiped out a unit of Eldar Jetbikes in combat and secured an objective on his own. In game 3, he took out some Pink Horrors in combat, but them embarrassed himself by being slaughtered by a lowly Thousand Sons Champion in a challenge. Sammael certainly works better when provided with re-rolls to hit in combat (he does get one with the master-crafted sword), as occasionally you will roll poorly and struggle to get many hits with him in combat. His strength of 4 is also a bit unfortunate as he can often struggle to take on more powerful characters or even bike-mounted foes. Overall, Sammael worked very well in the army, only dying in one of the three games. I would definitely take him again. Hi everyone, here are some of the photos of the armies on display at Blog Wars X. First up we have some of the entrants for best army. Welcome to the third and final battle report from my games at Blog Wars X. Game 1 and Game 2 had seen two solid victories for my Ravenwing, meaning that in game 3 I found myself at the lofty heights of table 1 for the final game of the tournament. What was even scarier was that I actually had a shot a winning the whole tournament! Game 3 was a maelstrom mission using a modified Blog Wars tactical objectives deck. There were 18 cards in the deck, three drawn each turn and six turns in the game, so you could potentially score every card during the game. The six seize objective cards were worth 2 pts each, the other cards were worth 1 or 2 pts depending on what the card was. Impossible to achieve cards were discarded before the game began (cards that became impossible to achieve as the game went on had to be kept) and one card could be discarded at the end of each turn. I was exceedingly nervous going into this game, given how high I was placed in the rankings (I must have been either 1st or 2nd). I was even more nervous when I saw that I was playing Matt and his Tzeentch Chaos Space Marines and Chaos Daemon army. Matt and I had chatted during the day and I found out that my army was the exact kind he expected to face at Blog Wars and had designed his army as a counter to it. He had at least three AP3 flamers in the army and all his psykers would be taking psychic shriek (great against bike armies), with Ahriman being able to cast it 3 times in one phase. To say this was going to be a tough game was a little bit of an understatement. 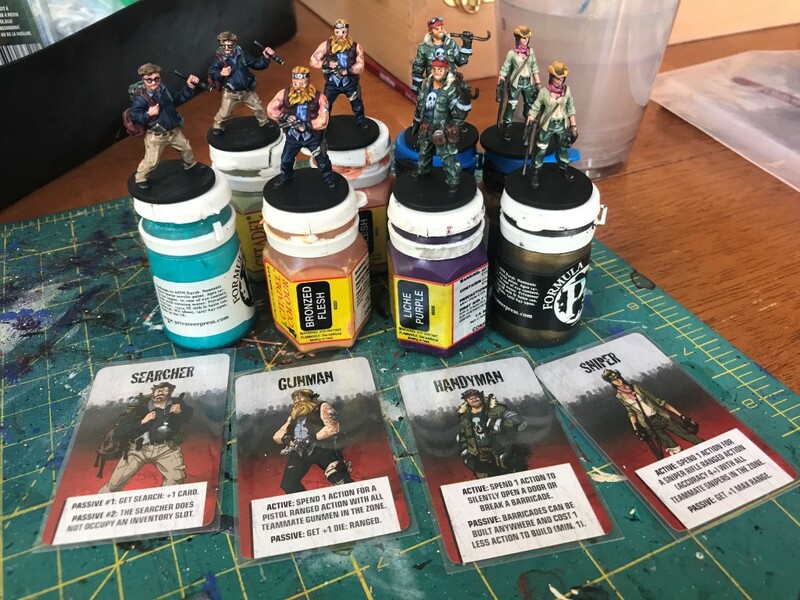 Welcome to my second battle report from Blog Wars X. Having won my first game, I found myself at table 4, going up against Tess' Eldar/Dark Eldar army. 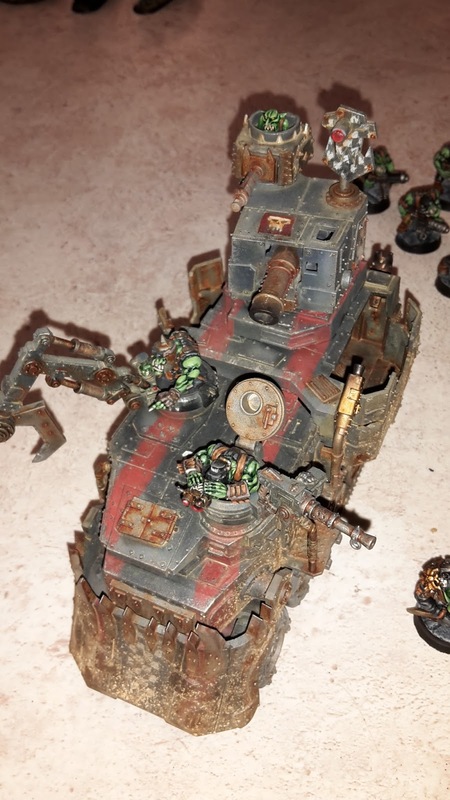 The mission was the Emperor's Relic; a modified Relic mission with an immobile Relic in the centre and one objective for each player in their own deployment zone. The Relic was worth 10 pts, your own objective was worth 5 pts and your opponent's was worth 15 pts. Secondary objectives were also in play. 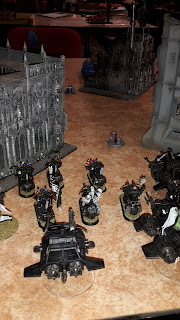 This was one of the missions I was worried about , as I only had one objective secured unit in my list (the tournament rules grant Sammael objective secured for this mission), so would have to completely control any objective I wanted to grab. His warlord trait gave him +1 to seize the initiative and re-rolls on his reserve rolls. His psychic powers were Eldritch Storm, Will of Asuryan and Mind War. Quite a tough Eldar list to face. The Archon/Wraithguard/Serpent combination meant the unit could deep strike anywhere on the board and D flame a unit of his choice. The Fire Dragons would embark on the Raider to deep strike also. Jetbikes are a pain as they are really fast and can put out a lot of firepower. Dark Reapers are great against Bike armies as they are AP3 and ignore Jink saves, meaning my Ravenwing would be in trouble. Thanks to the +1 to reserve rolls from the Autarch and the re-rolls to reserves from the warlord trait, the Eldar reserves were practically guaranteed to arrive on turn 2. I won the roll for table side and chose the side with the Ruins to deny them to Tess. I won the roll for deployment too and elected to go first, hoping to hit the Eldar hard before they could strike. 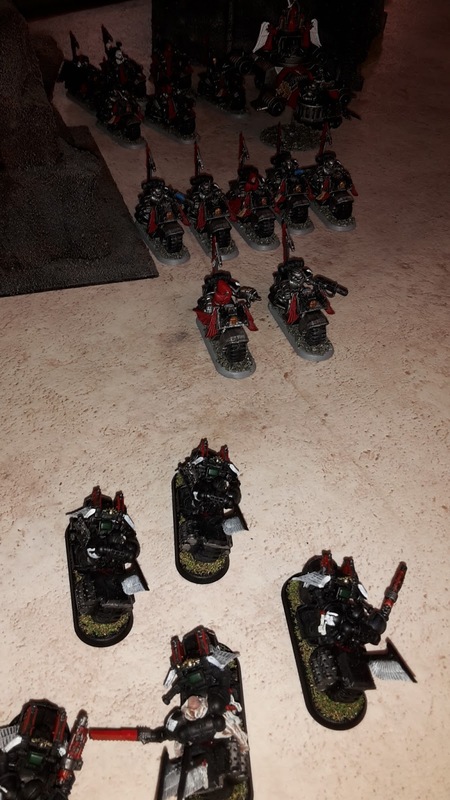 I deployed everything forward, the Ravenwing support squadron covering the Command Squad. In reply, Tess set up only three units. The Warp Spiders and warwalkers deployed in the rocks to my right, with the Kabalite warriors deploying to the left at the back. Deployment and Scout moves. The shields represent the objectives. 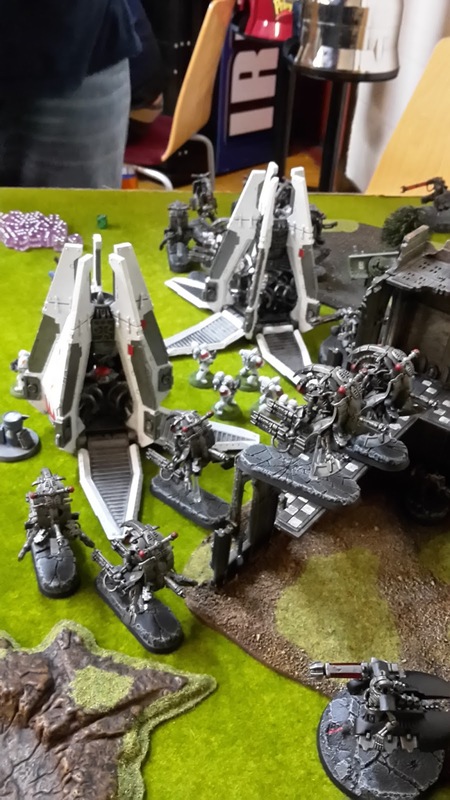 Welcome to the first of my battle reports from my games at Blog Wars X (run by Alex at From the Fang). This was the second time that I had attended Blog Wars, the first being Blog Wars 9 earlier in the year. Last year, I finished 13th out of around 50 gamers, so was keen to see if I could equal or beat my result this time around. It is an awesome event (not just for bloggers) and I got the chance to meet up with some fellow bloggers and some friends I made at the last tournament. A big thanks to Luke (from Darksun Life), Pete and Daniel for letting me join their (rather sizeable) contingent this year at the tournament and for being great company over the weekend. Luke from Darksun Life. I met Luke and his mates at Blog Wars 9 after chatting on the 40k addicts facebook page. It was nice to finally meet them and have someone to hang out with for the weekend. We even faced each other in the final game of Blog wars 9. I lost, but it was a great game. Luke had recently got back into blogging (and started vlogging) after a long absence and I look forward to seeing what appears on the blog from now on (as well as going back and reading his older stuff). Rob from "From the Horus Heresy to Infinity and Beyond". I feel a kindred spirit with Rob as we both started blogging about 40k at pretty much the same time (he beat me by 10 days!). Rob brought a fantastic Death Company army and was a great bloke to finally meet and chat to. Dave from Confessions of a 40k addict. 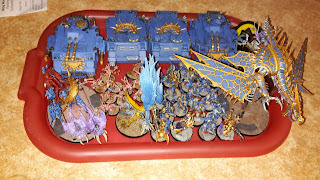 Dave's blog was a great inspiration when I was starting mine and he brought his fantastic Nids army once again to Blog Wars. NafNaf from Objective Secured. NafNaf had his amazing Thunderwolves army with him again. We actually faced one another in the first game at Blog Wars 9. It was a bloody affair, full of terrible dice rolling on both sides. Alex from "From the Fang". Last, but by no means least, the power behind Blog wars. Alex has put on 10 Blog Wars, two of which I have been fortunate enough to attend. I always have an amazing weekend when I have gone and hope to keep going to his events in the future. Everyone else from the weekend who I may have missed and everyone who made it such a great weekend. Special thanks to Leicester Sabres who welcomed me in to the ranks and for the staff at the North West Gaming Centre for all they did during the weekend and for putting on an amazing game of Werewolves on the Friday night. Last time round, I took my White Scars to Blog Wars, this time I wanted to give my Dark Angels a go. As Blog Wars is a friendlier list event (particularly filthy lists are returned to the owners for modification and only 2 detachments are allowed with no multiple detachments such as Decurion and Battle Company allowed), I decided to take my all Ravenwing force as a nice thematic army that still packed a good punch. I posted my list earlier, highlighting my choices and what I saw as the strengths and weaknesses of the list. 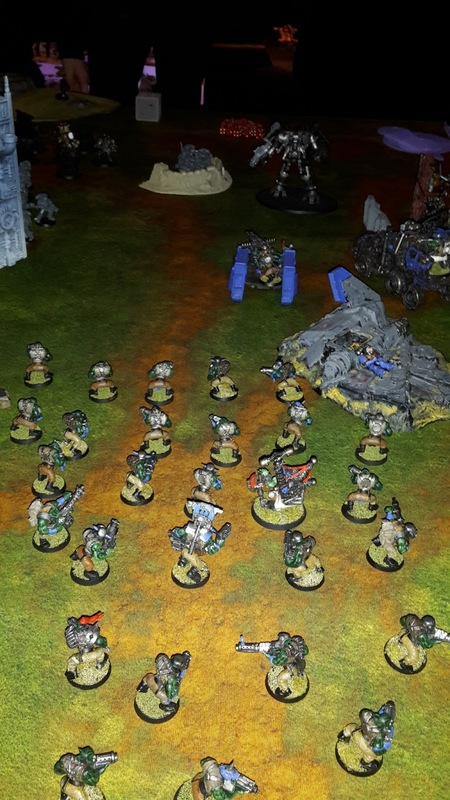 The first game of the tournament was good old "Purge the Alien" using Hammer and Anvil deployment- kill one another with Blood Points awarded for killing each enemy unit (equal to the victory points cost of the unit if destroyed or half points if taken below half strength/wounds/hull points). 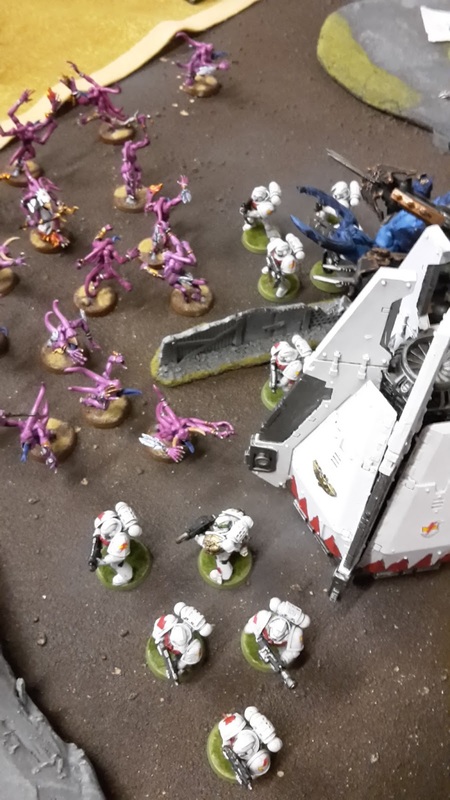 Fresh-faced on Saturday morning, I found myself at table 14, facing Ian and his own Dark Angel's army, consisting of the Ravenwing Strike Force and Deathwing Strike Force, but with his own Guardians of the Covenant army featuring a Razorwing/Doomwing force. This would be an interesting match up; I would get to see how annoying my re-rollable Jink saves were going to be first-hand. Welcome to part 2 of my review of the new White Scars rules in War Zone Damocles: Kauyon. Part 1 covered the new Warlord Traits, Relics and tactical objectives cards in the supplement, part 2 will look at the new formations available to the White Scars (and other marine chapters). Several new formations have been included in the new expansion book for the White Scars to utilise. These focus on the fast-paced, highly mobile style of war that the Scars are famous for and includes a new multi-formation detachment known as the "Scarblade Strike Force". All infantry units must be mounted in a Rhino or Razorback at the start of the game. Mobile Firebase- allows bikes and jump unit to move 2D6" after shooting and infantry units to move D6" after shooting (unit cannot assault). Also allows units to re-embark in a transport if they can all get within 2" of an access point. I recently purchased the new 40k expansion War Zone Damocles: Kauyon. I'm looking forward to reading through the story and taking a look at the new missions, but my main focus for buying the book was to access the brand new rules for the White Scars. 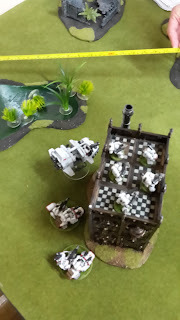 I really like my White Scars army, they play great on the table and it is really easy to put together a thematic force that is still very powerful on the table. I thought I would take the time to review the new rules that have been released for them. Part 1 will look at the Warlord Traits, Relics and new Maelstrom cards for the Sons of Khan. Part 2 will look at the new formations available for the White Scars (and other chapters). 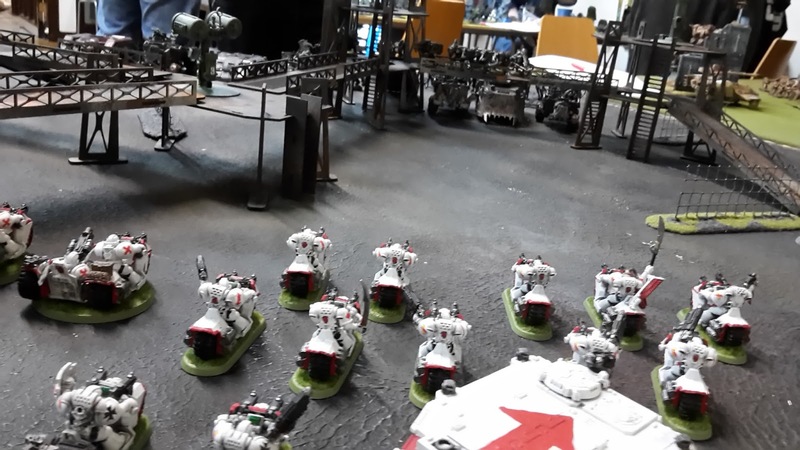 The Chapter Tactics for the White Scars remain unchanged in the new rules. Considering they are one of the best available in the current Space Marine Codex (at least, in my humble opinion), this is a good thing. So, without further ado, lets get on to the review. White Scars armies now have access to their very own warlord traits table that they can roll on instead of the Space Marine table (or Rulebook ones). Grants your warlord +1 to his Jink save if on a bike (if not, you get 2 instead). A really useful trait, giving your Warlord a 2+ Jink save (no longer just for the Ravenwing). A tooled up warlord with Artificer Armour, Shield Eternal and this trait will be a tough nut to crack in an army, able to tank most wounds and keep going. Get +1 or -1 to reserve rolls when your Warlord is on the table or still in reserve. A very useful trait for ensuring that any reserves arrive on time or delaying them later in the game for some objective grabbing. Shame it cannot be combined with Khan's scouting ability to give you Outflankers that arrive very quickly on the board, so only useful for Outflanking Scouts or Scout bikes. Nevertheless, reserve manipulation is normally pretty great in the game, but there are better ones on the table. Having posted all my battle reports from Rapid Fire 2015, I thought I would take my usual look at how the army performed at the tournament and what could be improved next time. 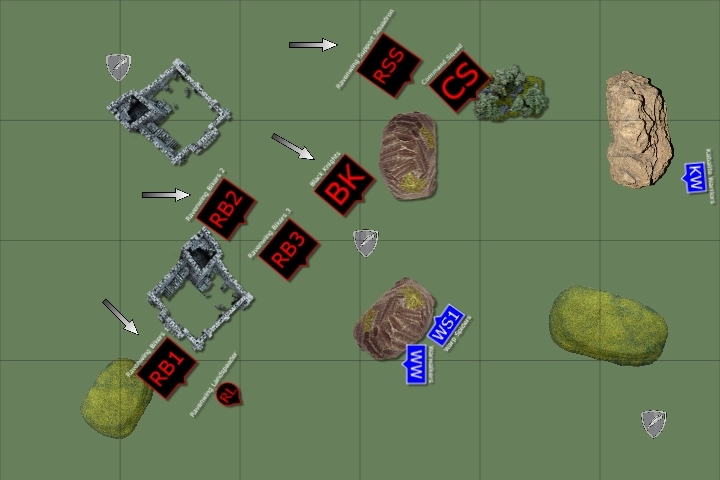 For context on the army review, check out the battle reports from Rapid Fire 2015 in the Tournament Reports tab if you have not already. 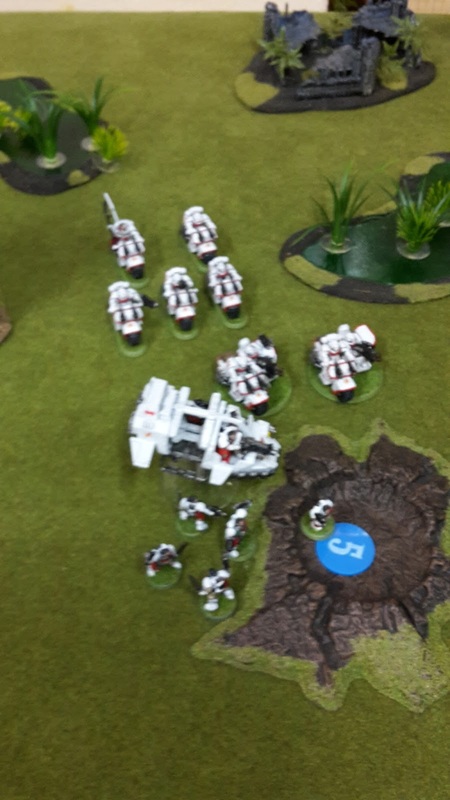 Almost an auto-include in a White Scars army, Khan did very well in my list. 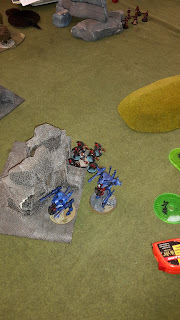 His ability to give Scout to bike units was extremely useful in game 6, allowing me to close with the Eldar army very quickly and cause huge casualties in the first turn. Outflanking was less useful, the outflanking unit generally being surrounded and destroyed by the enemy army quickly after arriving, or not getting to arrive at all (such as in Game 3). I will probably avoid using Outflank in the future, but it all depends on the game and objectives. He joined the Command Squad in every game. I think this was a good choice as he boosted their combat potential. I tried not to put him in combat too often, but they few times he did get in to combat, his AP3 sword and (sometimes) instant death attacks proved quite useful. His new Warlord Trait allowed morale check re-rolls was also very useful, saving my units a few times during the tournament. 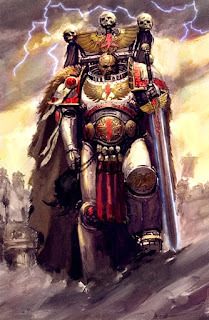 I would probably use him again in a tournament list (depending on whether the new White Scars formations grant Scout without him). 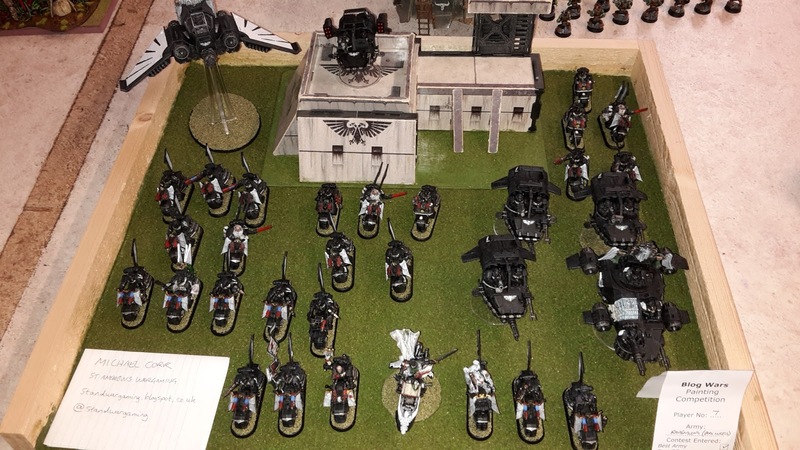 Welcome to my Armies on Display post from Rapid Fire 2015. 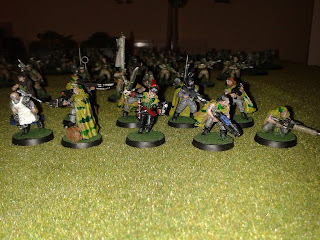 There were some amazing armies taken to Rapid Fire and I managed to get photos of a lot of them. 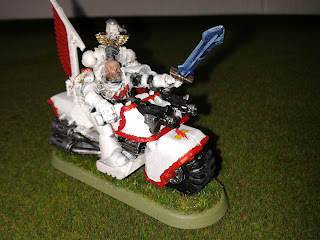 First up is my own White Scars. I was very fortunate to get some compliments on my army over the weekend, nowhere near some of the amazing standard on display, but very nice to get nonetheless. Welcome to the final battle report from my time at Rapid Fire 2015. Game 6 saw my White Scars taking on another Eldar army in the mission Crusade (5 objectives) with Dawn of War deployment on table 10. I started the game in position 19 on the rankings, just below the half way point- I would need a good result in this game to make it into the top half of the table. My Librarian ended up with Psychic Shriek and Misfortune after rolling on Telepathy and Divination. 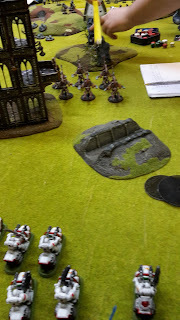 After the kicking I took in the last two games, I found myself at the lower end of the tournament listings, playing my next game on table 12 against Jason's Daemons and Chaos Space Marine army. This mission would be Deadlock with Vanguard Strike deployment. Deadlock is a maelstrom mission where you draw 6 cards on turn 1, 5 on turn 2, etc., so it is very important to start scoring points early on as your opportunities to score decrease each turn (impossible cards to achieve could be re-drawn without penalty). The battlefield looked to be a blighted wasteland with a large building in the centre and a couple of hills and rock formations scattered around the board. For this game, my psychic powers were once again Presecince and Psychic Shriek. Blog Wars Bound and 500 comments! 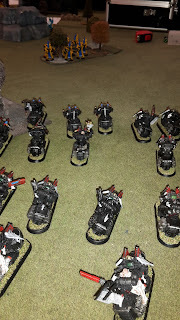 This morning I am setting off to Stockport with my Ravenwing to attend Blog Wars X (run by Alex at From the Fang). Good luck to everyone heading there. If you read my blog and are going to blog wars, please stop by and say hello, always nice to meet people at tournaments and put a face to the name. 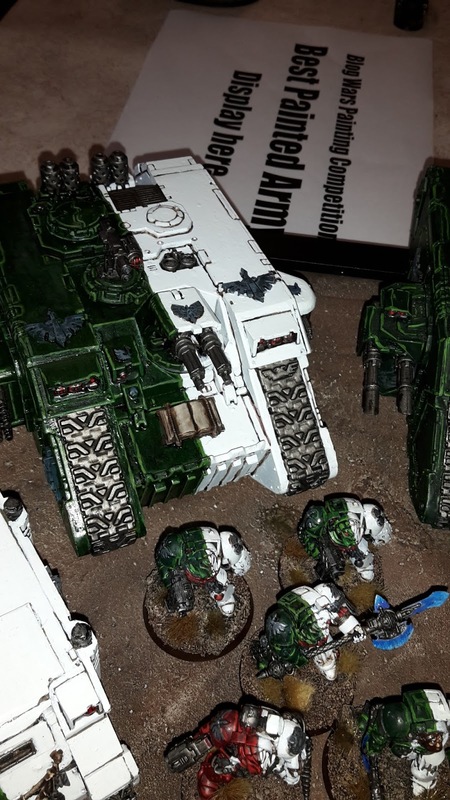 Welcome to my battle report for game 4 from Rapid Fire 2015. This was the first game on the Sunday and I was hoping to add some victories to my tally of games. On a side note, the Saturday night before was when the clocks changed in the UK. Idiot that I am, I managed to put the clock forward instead of backwards. So, instead of getting up at 7 am to travel to Stirling, I wound up waking at 5 am. Needless to say, I went back to bed for a couple of hours to try and get some more rest before my journey! The first game of day two was Purge the Alien with Hammer and Anvil deployment. My opponent was Martin and his Necron Decurion army. This was possibly one of the worst missions to face against the Decurion. I know from experience how durable the Necron Decurion formation can be and knew this would be a hard fought game to try and wipe out the enemy army. For this game, my psychic powers were once again Presecince and Psychic Shriek. I decided not to combat squad the tactical marines- no point giving up additional Kill Points. 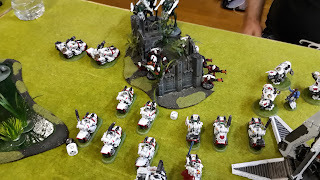 Welcome to battle report 3 of my games from the Rapid Fire 2015 tournament. After winning Game 1 and Game 2, I found myself on the lofty heights of table 4 facing up against James' Eldar. The third mission was a special one called "The Emperor's Relic" using Dawn of War deployment. This mission featured a Relic in the centre of the board (which could be moved) and a fixed objective for each player to place in their deployment zone. The Relic was worth 5 pts, while each objective was worth 3 pts. My Librarian rolled on Telepathy and the first roll came up with Invisibility! I continued to roll on the table and got Hallucination and Psychic Shriek. I think this is only the second time I have ever gotten invisibility (albeit a comp'ed version at this tournament) as I rarely roll on Telepathy. 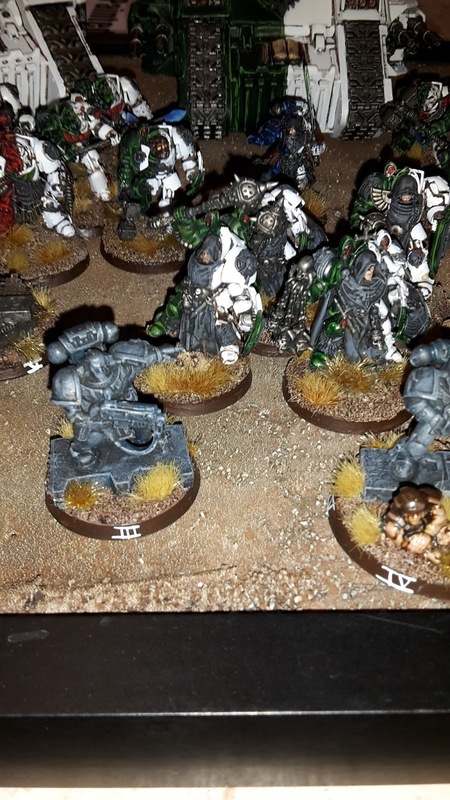 Welcome to my battle report for game 2 of Rapid Fire 2015. 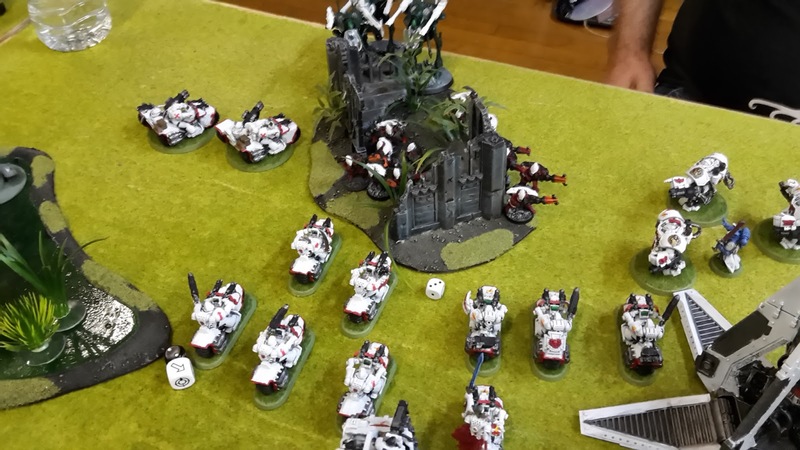 The last post gave an overview of the tournament and my report for game 1, where my White Scars took on an Ork army. 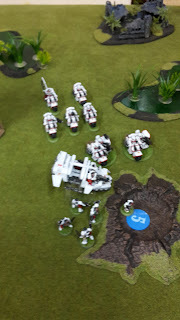 The second game of the Saturday saw the White Scars taking on Duncan's Necron Decurion list on table 6. 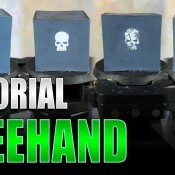 The mission was Cleanse and Control using Hammer and Anvil deployment. Cleanse and Control is a maelstrom mission, where up to 3 cards are drawn each turn. Having faced a Decurion once before, I knew that they were extremely durable, but lacked objective secured, so I would have some advantages in a maelstrom mission (namely my mobility and objective secured). It was a lovely looking army, so was sure to be a great looking game regardless of how it went. Once again, my Librarian ended up with Psychic Shriek and Prescience. 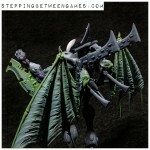 Looks to be quite a solid list, but slow (with the exception of the Tomb Blades). The Hammer and Anvil deployment should help me keep away from the Necron units as much as possible. I was also pleased to see no Wraiths in the list. It's hard to make a plan for maelstrom missions as you don't know what cards you will get. I would instead focus on trying to score as many cards as possible and not worry too much about killing the enemy (as it is very difficult to do for a Decurion). 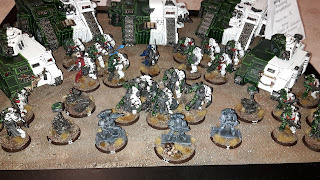 Hi everyone, and welcome to my first battle report from the Rapid Fire 2015 tournament. Rapid Fire is held by the guys from Stirling Wargamers. I'll go into more details in a future post, but I'll just say from the start that I had a fantastic weekend and well done to the guys for running such a great weekend that was very well organised. The tournament consisted of 6 games of 40k over two days, featuring a mixture of eternal war and maelstrom missions. Lists were 1850 pts and could include units from up to two detachments (which could be formations). Armies could not include "come the apocalypse" allies and a maximum of 600 pts could be spent on Forgeworld/Superheavies/Gargantuan creatures. There were some comp rules including; maximum 18 warp charge dice, re-rolled saves capped at 4+ and invulnerable saves allowed vs destroyer weapons. Each mission would use a mixture of primary and secondary objective victory points to determine the winner and the differences between the victory points for both players would determine how many tournament points they each scored. For the missions, First Blood was replaced with Draw Blood; select an enemy unit, if they are destroyed by the end of the game, you achieve the objective. A nice change that reduces the importance of going first in missions. The first game was crusade (5 objectives) using Vanguard Strike deployment and I would be playing against Craig and his Orks. I have previously posted on my army list choices and the strengths and weaknesses of the list. Following Lightning Slayer's advice on psychic powers in the post, I decided to roll once on Divination and Telepathy. I didn't like the rolls, so ended up taking Prescience and Psychic Shriek as the primaris powers. I think this gives the Librarian some more flexibility- Prescience should help the centurions wipe out whatever they target and Psychic Shriek may be very useful against Orks with their low leadership. (On a side note, Lightning Slayer has recently got back into blogging after a LONG absence. You should check out his blog, where hopefully I will be finding out more valuable tactical insights).